Why did Boston’s act of political vandalism lead to a British military expedition against small towns in Massachusetts sixteen months later? How, exactly did evolving political tensions result in actual warfare? In a much-needed narrative, historians Ray and Marie Raphael fill in the movement toward those first shots at Lexington and Concord. 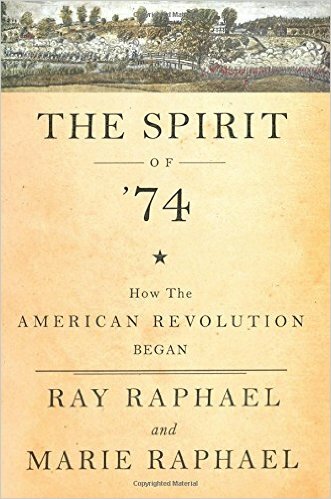 In a primary source driven, easy to read history of that year before and leading up to 1775. However, “our story slows, pausing at additional markers that are often bypassed or slighted” (x). Therein lies “only in a full telling is war a plausible outcome” (x). The Raphael duo fluidly walks the reader through the build-up to that fateful April 1775 day. The book sheds light on developments in towns and counties across the colony of Massachusetts. A timeline in the beginning provides a good resource to remember the important dates as you read. With the British response to the Boston Tea Party of December 1773, committed activists perceived that Britain had handed them a blueprint for disenfranchisement (44). What would be seen in the colony as the Coercive Acts, which, among other changes nullified the Charter of 1691 which colonists in Massachusetts held as sacrosanct. When the news of what the British government had did, which arrived in the harbor of Boston in May 1774 until the following April 1775, “resistance would mount, coalesce, and manifest itself in armed, relentless rebellion (44). That coalescing would resemble an accordion, with Boston being one end and the countryside of Massachusetts the other end of the instrument. Both ends would reverberate the bellows as ideas, exchanges of opinions, passive and aggressive action, all marred the intervening months of 1774. Until as Abigail Adams wrote many months before April 1775, the”flame is kindled and like lightening it catches from soul to soul” (192). The Raphael duo capture what the farmers in Berkshire set in motion, in accordance with capturing the attitude of townspeople in Worcester, Massachusetts at the same time. These various local uprisings, which put an emphasis on peaceful activities coalesced into the call for committees and eventually into the need for the Provincial Congress. This Congress acted as the de-facto governing body of Massachusetts in response to British measures to subdue and punish the intransigent rebels. Every once in a while a monograph is written that fills a necessary void in the field of early American Revolutionary history. This history is definitely one of those as it fills in that critical, yet overlooked, time period in the build-up to the fighting between British-American colonists and the redcoats that represented the mother country. One cannot hope to understand the events of 1775 and beyond without knowing how the colonists of Massachusetts, so many that have unfortunately been lost to the passing of time, began the protests that led to independence, beginning in the years before. Or as the authors more succinctly state; “and so begins a story we know” (214). This entry was posted in Revolutionary War, Uncategorized and tagged Abigail Adams, American colonists, Berkshire, Boston, British, Concord, First Shots, Lexington, Marie Raphael, Minutemen, Ralph Waldo Emerson, Ray Raphael, Spirit of 1774, The New Press, Worchester. Bookmark the permalink. I enjoyed Raphael’s earlier work, The First American Revolution. This book appears to cover some of the same ground. How is it different? Thanks for the catch and the comment. I have not read Raphael’s earlier work, it is on my “to-read” list, which seems to grow daily! This book gives an overall sweep of affairs leading up to the first shots and brings a lot of the actors in these stages to light. It is a nice overview of the year before the first shots. Hope that helps.